Substances, including drugs, gases, and hormones, are transported through the body within the bloodstream and airflow in the Cardiovascular and Respiratory Systems, respectively. This provides important nutrients and waste removal for normal physiologic function. The engine models advection in both fluid systems (see Substance Transport Methodology). Transvascular transport is simulated using one of several diffusion models (see Tissue Methodology) for substances generically. Drug transvascular transport is modeled with a physiologically-based pharmacokinetic (PBPK) model, and the physiologic effects on the body are modeled with a low-fidelity pharmacodynamic (PD) model. One major category of substances transported through the body is drugs. Drugs influence the body by moving it out of homeostasis for a specific purpose, such as sedation for surgical intervention, or to address a patient condition, such as analgesic intervention. After a drug enters the patient’s body (through intravenous administration, absorption through the gastrointestinal system, or inhalation of an agent), the substance ultimately is transported through the bloodstream for uptake by the tissues and organs. The process of clearing a drug from the system is accomplished in a combination of three methods: renal clearance, hepatic clearance, and systemic clearance. Depending on the drug, it may be processed by either the kidney, the liver, or both for removal from the system as a waste product. Additionally, drugs are metabolized by the body and removed from the bloodstream. These methods all reduce the amount of drugs in the system. The drug transport and clearance methodologies in the engine are described below. Pharmacokinetics is the study of the relationship between the dose of a drug and the time-evolution of the concentration of the drug throughout the body. The relationship between the concentration of a drug and the physiological response is described by the pharmacodynamics . The engine has both pharmacokinetic and pharmacodynamic models. Because it is physiologically-based, the pharmacokinetic model has resolution at the same scale as the cardiovascular and respiratory systems. Physiologically-based pharmacokinetic (PBPK) modeling is a technique that mathematically models the distribution, uptake, metabolism, and clearance of a drug with consideration of the relevant physiological processes . The PBPK model provides more resolution than the classic one and two compartment models. The PBPK model also provides a base on which to build a receptor-based pharmacodynamic (PD) model, although the PD model is currently a lower-fidelity phenomenological model based solely on the concentration of a drug in the blood. Drugs impact body-level physiologic behavior such as heart rate, respiration rate, and blood pressure as result of cellular-level interactions caused by a drug that changes the behavior of physiologic entities, such as blood vessels and electrical activity in the heart. The cellular-level processes are not modeled in the engine, and instead the PD model is a direct relationship between concentration and maximum effect for a body-level response. All substances added or removed from the engine body are incremented or decremented from the appropriate compartment during the Preprocess step. For example, if substances are administered via a bolus injection or through intravenous administration, the substance mass is increased in the vena cava compartment. The generic substance methodology developed for the engine is used to solve for the mass, concentration, substance volume, and volume fraction in each compartment. After the masses and concentrations have been updated, the system-level effects of any circulating drugs are calculated using the pharmacodynamic model. The Post Process step moves everything calculated in Process from the next time step calculation to the current time step calculation. Substances have no specific Post Process functionality. Each system post processes their circuit and moves the mass, concentration, substance volume, and volume fraction from next to current. Figure 1. The data flow begins with a Preprocess step where substances entering or exiting the engine body are incremented or decremented. During the Process step, the mass and concentration (blood) or substance volume and volume fraction (air/gas) are calculated for each compartment in a system. During Process, the effects of any drugs in the system are calculated. There is no specific Post Process functionality in substances. However, as other systems post process their circuits, the substance values are moved from the next time step to the current time step calculation. Pharmacokinetic models quantify the time evolution of drug distribution from the administration of a dose. Pharmacodynamic models, on the other hand, characterize the events from the arrival of the drug at the site of action to the “onset, magnitude and duration of the biological response [rosenbaum2012basic.”] The Drug system contains both pharmacokinetic and pharmacodynamic models. The pharmacokinetic (PK) methodology provides a means for simulating the time-evolution of the distribution of a drug throughout the body. This is accomplished by using the administration actions discussed in the Actions section below, the transport methodology, the perfusion limited diffusion methodology, and the substance files discussed in the Common Data Model documentation. Once a drug is administered, it either enters the Cardiovascular System (liquid) or the Respiratory System (inhaled). If it is an inhaled drug, modeled in the engine as a gas, the drug will move into the alveoli through advection then diffuse into the Cardiovascular System through alveoli transfer. Drug effects, described below in the drugs-pharmacodynamics section, are then computed based on the concentration of the drug in the plasma. 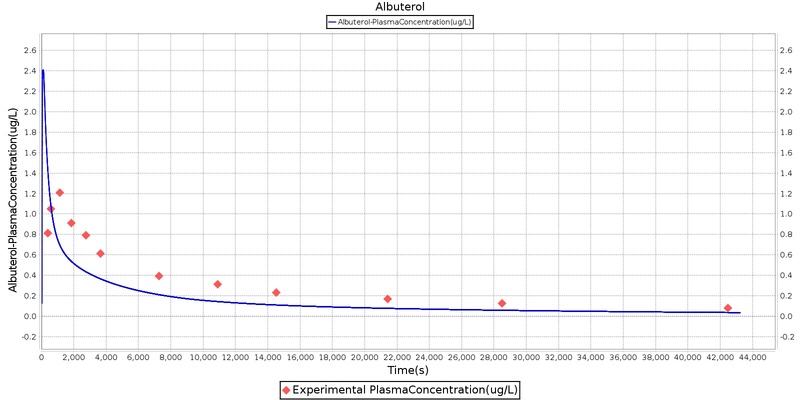 Note that the plasma concentration calculation is currently incorrect. The concentration of a drug is currently computed by dividing the mass of the drug in a compartment by the volume of plasma, as computed from the hematocrit. Implicit in the plasma concentration calculation is the assumption that all of the drug is in the extracellular space. In actuality, some of the drug will cross blood-cell membranes, and the concentration of drug in the plasma and in the blood is a function of many factors, including the lipophilicity. We will address this error in the future. The drugs circulate around the cardiovascular circuit via the generic transport methodology described in the Circuit Methodology. However, drugs diffuse from the Cardiovascular System into the tissues via perfusion limited diffusion. For each drug, the physicochemical properties are used to calculate the partition coefficient. This partition coefficient describes the affinity for the particular drug to diffuse across the barrier between the cardiovascular and tissue spaces. Each drug has its individual physicochemical properties described in the substance file with a calculated partition coefficient for each tissue compartment. For a very weak base, an acid, or a neutral, Equation 1 is used to calculate the partition coefficient. For moderate to strong bases, Equation 2 is used to calculate the partition coefficient. Where X and Y are the different relationships for pH, as shown in Table 1, fIW is the fraction of intracellular water, fEW is the fraction of extracellular water, fNP is the fraction of neutral phospholipids in the tissue, fNL is the fraction of lipids in the tissue, P is the octanol:water partition coefficient for the drug, fu is the fraction of the drug unbound in plasma, fNL,P is the fraction of neutral lipids in plasma, fNP,P is the fraction of phospholipids in plasma, and PRT / PRB is the tissue to plasma ratio of the binding protein. Table 1. The pH effects on the partition coefficient are described based on the drug type, i.e., very weak base, acid, or neutral. X relates the drug property pKa to the pHIW, intracellular water pH, while Y relates the pKa to the pH of the plasma. A number of these values are drug parameters found in the substance file definitions. However, many of them are organ/compartment dependent as shown in Tables 2 and 3. Table 2. The volume fractions for neutral lipids and phospholipids vary by compartment. These values are specified for each compartment as outlined below and used to calculate the partition coefficient of each drug for each tissue compartment in the engine. These values were found in . Table 3. The tissue to plasma protein binding ratios are shown for each tissue compartment in the engine. Two proteins are available for drug binding, albumin and lipoprotein. The binding protein for each drug is specified in the substance file. These values were found in . The implementation of the partition coefficients calculation and all values shown in the tables are derived from the literature     . If it is not possible to obtain the information required to compute the partition coefficient for a drug, or if the calculation is not valid for a particular drug for any reason, it is possible to override the computation by directly inputting a constant partition coefficient in the drug file. Note that, to use this functionality, it is best to input a coefficient for every tissue compartment in the model. The engine currently uses the coefficient-computation override methodology for Albuterol, Ketamine, and Naloxone. The parameters used to calculate each partition coefficient were found in published data and/or tuned to get the desired kinetic response. The above partition coefficients are used to calculate the diffusion of a drug across the tissue-vascular barrier. All current drugs in the engine use perfusion limited diffusion as found in  . For details on perfusion-limited and other diffusion modalities, see the Tissue Methodology. In the current version of the engine, all drugs diffuse by the perfusion-limited model described above. An alternative means for modeling drug kinetics would be to leverage the other diffusion methods described in the Tissue Methodology report. The other diffusion models were developed primarily for the transmembrane transport of ions and a few specific organic molecules (e.g. glucose), and they have not been tested for drugs. The PBPK model represents renal, hepatic, and systemic clearance. The renal clearance rate, intrinsic clearance rate, and the systemic clearance rate are specified in the substance file in units of milliliter-blood per second per kilogram. The intrinsic clearance rate is used to calculate the hepatic clearance, as shown in Equation 3. Where ClH is the hepatic clearance, fu is the fraction of the drug unbound in plasma, ClI is the intrinsic clearance, and BW is the patient body weight. The amount of drug removed (cleared) from the system is found by calculating the amount of fluid volume that can be cleared by a healthy organ. The volume is calculated, as shown in Equation 4. This process is completed for the renal and hepatic clearance. 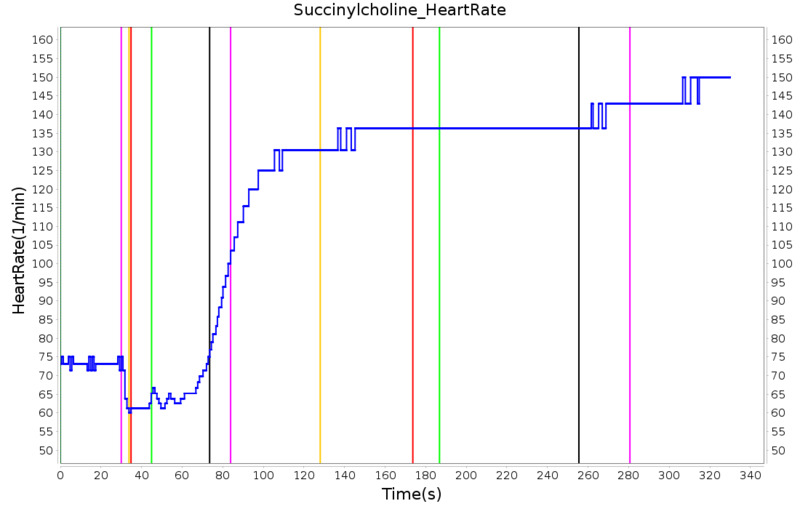 Where Vcl is the volume cleared, ClH is the organ clearance rate, BW is the body weight, and dt is the time step. The actual mass of the substance removed during this process is found by determining the amount of the drug in the volume cleared, as shown in Equation 5. Where Mcl is the mass cleared, Vcl is the volume cleared, and C is the concentration in the tissue. The systemic clearance represents the total clearance for the body, including the renal and hepatic clearance. Therefore, the total volume cleared is calculated, then the renal and hepatic clearance volumes are removed, as shown in Equation 6. The “remaining” systemic mass cleared is calculated as shown in Equation 5. Half of the mass cleared from renal clearance is removed from each of the kidney tissue compartments, the mass cleared from hepatic clearance is removed from the liver tissue compartment, and the mass removed from the “remaining” systemic clearance is removed from the vena cava compartment. This is assumed to be from various metabolic processes in the plasma. Where Vcl is the remaining systemic volume cleared, Cls is the systemic clearance rate, BW is the patient body weight, dt is the time step, VclR is the renal volume cleared, and VclH is the hepatic volume cleared. Pharmacodynamic (PD) models characterize the effect that a drug has on the organism. The current version of the code contains two pharmacodynamic models. Due to difficulties in measuring drug concentrations at the site of action as well as the varied and complex nature of the chain of events from receptor binding to biological response, drug responses are often quantified indirectly through surrogate endpoints. Development of the pharmaocodynamic model began with a characterization of expected results by subject matter experts for a small library of drugs. The expected results were limited to whole-body biomarkers similar to vital signs (e.g. changes in heart rate, respiration rate, blood pressure, etc.). We treated the expected results as surrogate endpoints and used the common Emax model to characterize the effects. Note that in this initial application, Emax referred to the expected effect of the drug rather than the maximum effect of the drug. For that reason, overdose is not possible with most of the drugs in the current version of the engine. However, the simple Emax model has been extended to a sigmoidal Emax model; therefore, it is possible to shape the response curve to better match empirical data, and setting the true maximum effect is as simple as setting the correct value in the drug file. We are beginning to convert the pharmacodynamics of some drugs to the true Emax model as data becomes available to us (see the future work section). The pharmacodynamic effects included in the plasma concentration PD model are described in Table 4. Table 4. Pharmacodynamic effects modeled in the engine with descriptions and relevant ranges. The drug effects are specified for each drug in the substance file. 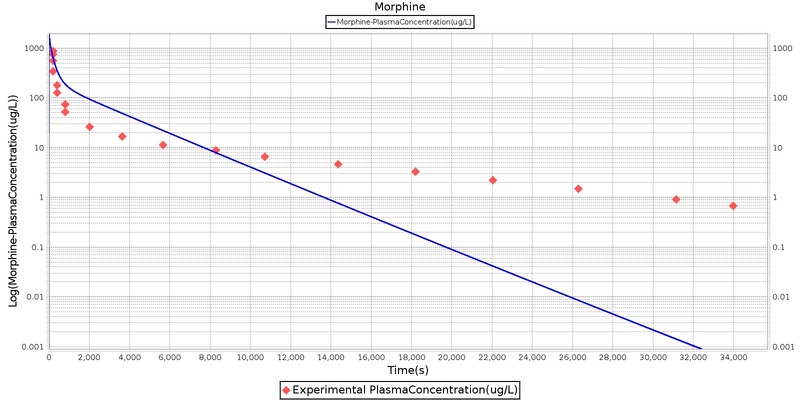 The level of effect is calculated based on the expected effect (or, for some drugs, the maximum effect) of the drug and the current plasma concentration for the drug, as shown in Equation 7 . Where Em is the expected (or maximum) effect of the drug, EC50 is the concentration at 50% of the effect, Cp is the drug concentration in plasma, Ebl is the baseline for that effect (i.e., heart rate baseline), ΔE is the calculated effect of the drug, and η is the slope factor . This calculation is repeated for each of the effects in Table 4. The drug effect is applied as a fraction of the baseline for the biomarker, which is a patient variable in the engine. For example, a person with a resting heart rate of 72 bpm may have a physiological process happening during simulation, perhaps as a condition, which increases his/her baseline heart rate to 80 bpm. If this patient is given a drug with a heart rate effect of 0.2, then at maximum the patient's heart rate will be 96 bpm (80 + 0.2 * 80). If the same drug were given to the same patient but without the condition, the maximum heart rate will be 86.4 bpm (72 + 0.2 * 72). The EC50 values were unknown for the majority of the drugs, so it was estimated from the maximum concentration of the drug at a standard adult dose, as shown in Equation 8. 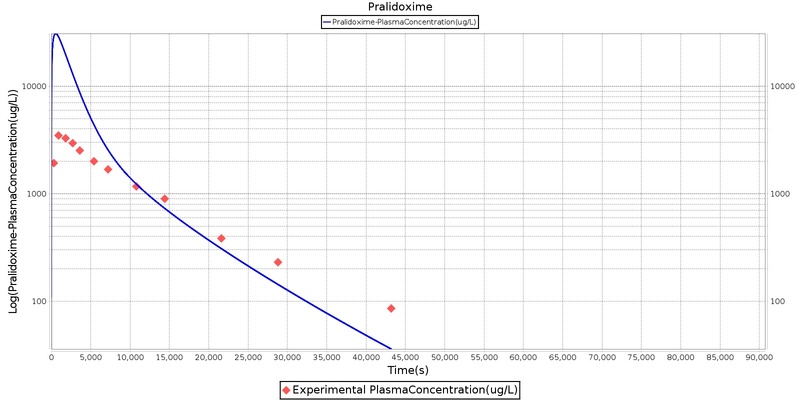 Where Cmax is the maximum plasma concentration for the standard adult dose and EC50 is the concentration at which 50% of the effect should be present. Equation 7 provides a straightforward calculation for the heart rate. However, to be applied in the cardiovascular system, the drug effects need to be translated to the effects on the mean arterial pressure and the pulse pressure. This is accomplished using Equations 9 and 10. These equations were developed using the relationship between diastolic and systolic pressure and the mean arterial pressure . Where MAP is the mean arterial blood pressure, DBP is the diastolic blood pressure, and SBP is the systolic blood pressure. These changes to the heart rate, mean arterial pressure, and pulse pressure are then system outputs for the drug system. The changes are then applied in the Cardiovascular System. For more details on the implementation of the effects see the Cardiovascular Methodology. As with the Cardiovascular System, the respiratory and tidal volume effects are relatively straight forward to apply. The neuromuscular block and sedation levels are calculated to have an effect level between zero and one, where zero is no effect and one is a maximal effect. The detail of how these are implemented can be found in the Respiratory Methodology. There are currently two drugs which utilize a localized PD effects model: Albuterol and Furosemide. Aerosolized substances have a direct effect on the respiratory system. There are two direct-effect aerosol substance properties. For example, Albuterol is an aerosolized drug that typically enters the body via nebulizer or metered-dose inhaler. Accordingly, in the engine Albuterol enters the body through the respiratory tract and diffuses into the respiratory tissues (see the aerosol section in the Environment Methodology report). The BronchioleModifier for Albuterol is set to 1 in the substance file, meaning that Albuterol has the capability to maximally dilate the bronchioles. The bronchodilatory effects of Albuterol are applied directly at the site of action, and the actual bronchodilation is a function of the concentration of Albuterol in the respiratory tissues. The pharmacodynamic effects of diuretics locally target the renal system's functionality. Local binding of the Na-K-2Cl symporter by Furosemide (Lasix) in the tubular lumen stimulates an increase in urine production and ion excretion. In the engine we simulate this effect by adjusting the reabsorption permeability as a function of plasma concentration of Furosemide. This enables simulation of the whole-body drug effects, but the model does not use the local concentration of drug in the tubular lumen as the primary determinant of the reabsorption adjustment. A mechanistic model based on traditional receptor theory which combines the tissue properties of receptor concentration and signal transduction with the drug properties of intrinsic efficacy and affinity to form a model of drug response would use the local tissue concentration as the first link in a causal chain leading to permeabilty changes and the appropriate downstream effects. This type of mechanistic model is recommended as future work. For details on the reabsorption and urine production of the renal system, see the Renal Methodology report. The results of the Lasix administration simulation are compared to data found in literature and presented in the validation section. The full list of drugs available in the data library can be found in Table 5 in the Validation section. Additional substances, such as oxygen, carbon dioxide, and hemoglobin that are available in the engine can be found in the Blood Chemistry Methodology. It is possible to customize the body that is simulated. For a detailed discussion of patient variability please see the Patient Methodology report. Variability in body morphology will obviously have an effect on the pharmacokinetics of a drug. For example, a larger body may have a larger plasma volume, and thus the plasma concentration for a specific dose of a drug will be less than the same dose administered to a smaller body. Additionally, the partitioning of drugs is dependent on the relative masses of the physiological compartments, and storage is affected by distribution. Lipophilic drugs may appear to remain longer in the engine plasma in patients who are configured with a higher body fat fraction. Patient configuration will also impact the pharmacodynamics. Maximum drug effects are computed as a fraction of baseline physiology. Changing a patient's baseline parameter (e.g. heart rate baseline) will also change the maximum effect (e.g. maximum heart rate) at a specific concentration of a drug. All drug validation is performed on a Standard Male. The substance calculations rely on the flow values calculated by the Circuit Methodology to calculate the movement of substances from compartment to compartment in each circuit. Any limitations and assumptions associated with this methodology will also be associated with the Drugs Methodology. The pharmocokinetic modeling is reliant on accurate values for the physical chemical properties of drugs. If these parameters are unknown or estimated from animal studies, the calculation for the partition coefficient may become unreliable. For some drugs, this information may be difficult to determine. The model also allows the user to supply partition coefficients directly. 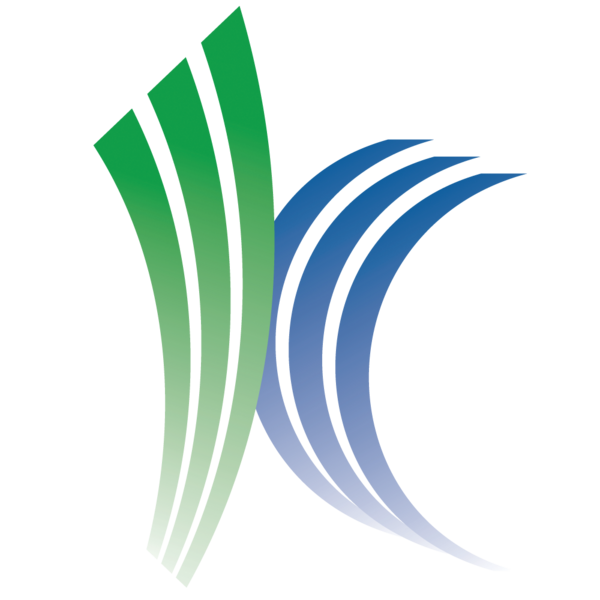 Some third party resources, both open source and commercially available, may provide this data for users, allowing incorporation of the data into the full body simulation. While this model is primarily used for drugs, it could be used for any substance in the body. The engine uses the clearance methodology for several additional substances. The modular approach to these calculations allows for the use of any combination of the three methodologies, PK, clearance, and PD. 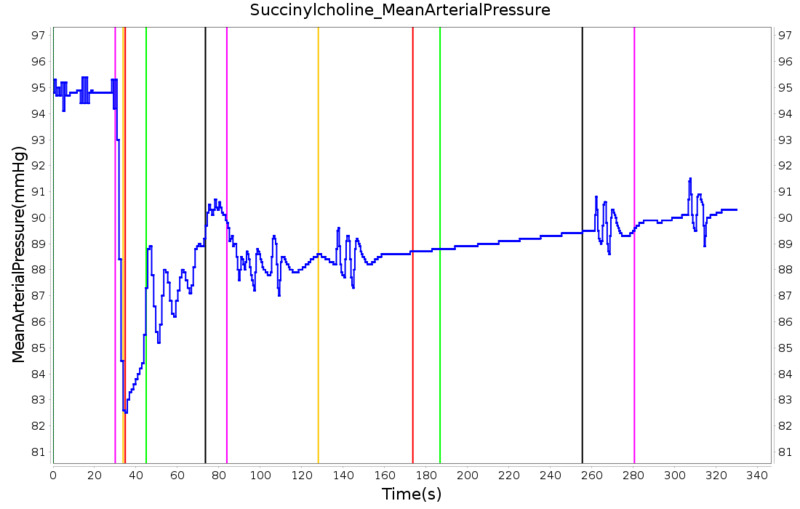 The substance values and calculations are used by a variety of systems to trigger actions and responses, define physiologic set points, scale circuit parameters, and modify driver frequencies. Many of these triggers and responses are discussed in the Blood Chemistry Methodology and the Endocrine Methodology. The drug-specific effects are listed and described briefly in Table 5. The implementation of these calculated responses can be found in the Cardiovascular Methodology and the Respiratory Methodology. The Drugs Methodology is based on the assumption that all substances are suspended in the fluid (blood or air, depending on the system) and move through the circuits with the flow. While this does allow for renal and hepatic clearance and metabolic elimination of substances, it does not allow for particle deposition. This assumption is valid for the level of fidelity of the model. In the future, particle deposition can be addressed by adding a more detailed substance methodology with factors for deposition within an organ, tissue, or blood vessel. Also, not included is a method for modeling vaporized substances, such as albuterol. In the future, we will add this methodology to allow a liquid in the respiratory tract and produce a more realistic representation of the behavior. The drug model addresses many of the earlier limitation of the drug model. This includes creating a substance file that uses physical chemical properties to define the pharmacokinetic properties and intuitive modifiers to calculate the pharmacodynamic effects. However, this implementation of a PD model works best with a drug with immediate effects, such as anesthesia medications. This implementation has not been tested for drugs with a later onset due to secondary mechanisms. This is an area for future work. Additionally, no drug interactions or intoxication is modeled. A bolus administration represents an injection of a substance in a single dose. The substance, concentration, and amount are specified by the user. The total mass for the dose is calculated by multiplying the concentration and the amount. The total mass is then incrementally added to the vena cava compartment over the course of two seconds to represent the slow depression of a plunger. Once added to the vena cava, the substance will circulate through the Cardiovascular System as part of the blood flow. The effects of the substance on the physiologic output will vary with the substance. Titration represents the administration of a single substance at a specified rate and concentration over time into the venous system. The user selects a single substance and specifies the concentration and rate with titration. As with intravenous administration, the mass of the substance is incremented based on the amount of the substance entering the system. The mass is calculated by taking the flow entering the system at each time step multiplied by the known concentration of each substance within the compound substance. This mass is then added to the vena cava at each time step until the intravenous administration is stopped. The added substances then circulate through the Cardiovascular System as part of the blood flow. The effect on the physiologic output will vary based on the compound substance selected. Intravenous administration represents administration of a compound substance (a single entity with multiple substances, i.e., saline) at a specified rate over time into the venous system. The compound substance, the rate, and the bag volume are specified by the user. At each time step, the mass of the substances are incremented based on the amount of compound substance entering the system. The mass is calculated by taking the flow entering the system at each time step multiplied by the known concentration of each substance within the compound substance. This mass is then added to the vena cava at each time step until the intravenous administration is stopped. The added substances will then circulate through the Cardiovascular System as part of the blood flow. The effect on the physiologic output will vary based on the compound substance selected. The Drugs Methodology has no resting state validation. All drugs in the data library were validated qualitatively or with subject matter expert input. The bolus injection methodology was validated by comparing the PK and PD results to literature. See the sections below for more detail. 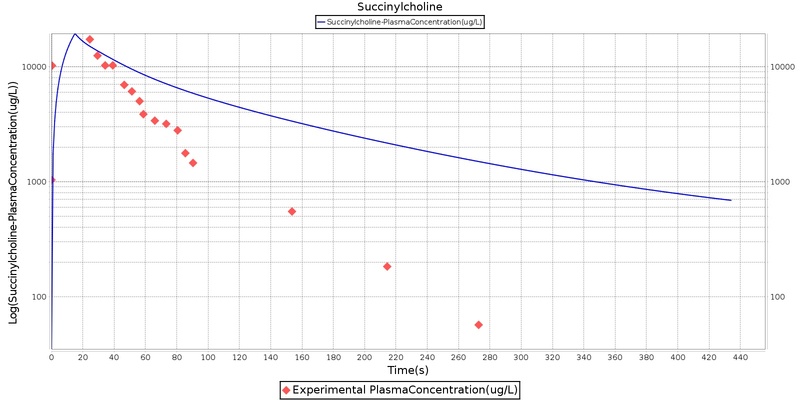 The succinycholine scenario shows a drug impacting the major engine systems. 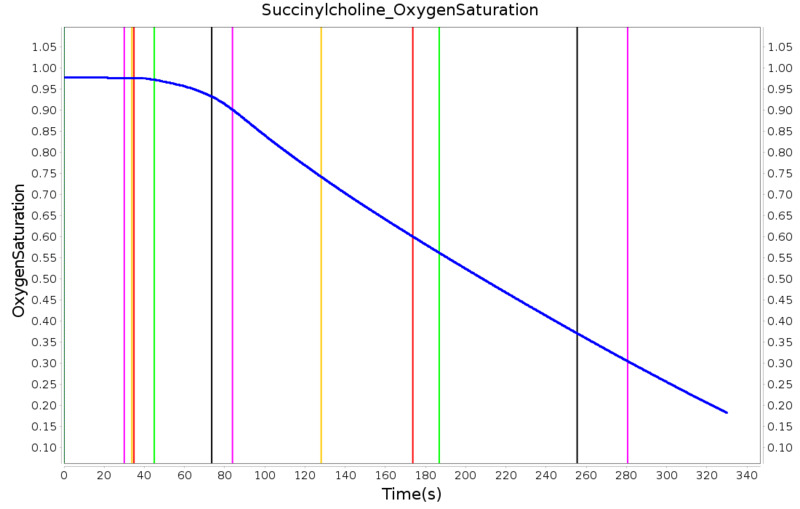 Succinycholine (Figure 4) initially drops the heart rate and blood pressure approximately 5–10%. As expected, the respiration drops to zero within 60–90 seconds to represent the paralysis associated with the neuromuscular blocker. The oxygen saturation drops slowly as the concentration of oxygen in the bloodstream drops, leading to hypoxia. Epinephrine is released in response to hypoxia, causing an increase in heart rate and blood pressure (Endocrine Methodology). This is an example of the interdependent nature of the engine systems and the chain reaction drug administration can cause. Figure 2. 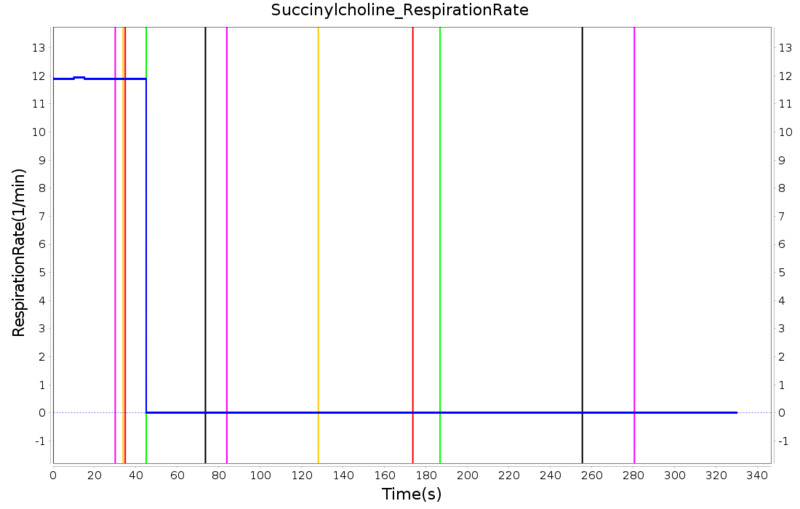 The neuromuscular blocker, Succinylcholine, causes a cessation of respiration due to its paralytic effects. The heart rate and blood pressure initially decrease due to the system-level drug effects. As the oxygen decreases, hypoxia occurs, resulting in an increase in heart rate and blood pressure. Validation of intravenous administration of a hypotonic solution and blood products can be found in the Cardiovascular Methodology. The PK model was validated by comparing the plasma concentration calculated by the engine to plasma concentration curves found in the literature. The comparisons are shown in Figures 4–14. No available data was found for Epinephrine, so this drug was only validated from a PD perspective. Figure 4. Albuterol is an aerosol. Alveolar exchange takes place bidirectionally as long as the "gas" (aerosol) is in the blood or in the environment. For that reason, the concentration of Albuterol in the plasma diminishes much faster in the engine than demonstrated in literature . This is a known issue and an area of future work. Figure 5. 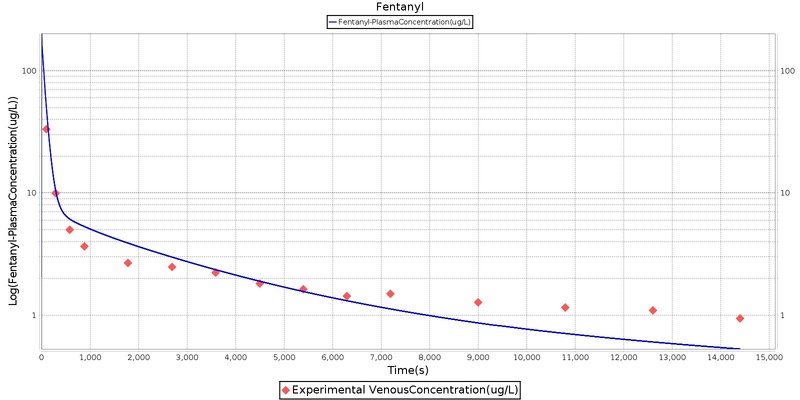 The physical chemical properties of fentanyl found in the literature were used to produce a good fit for the plasma concentration. The experimental data was found in . Figure 5. 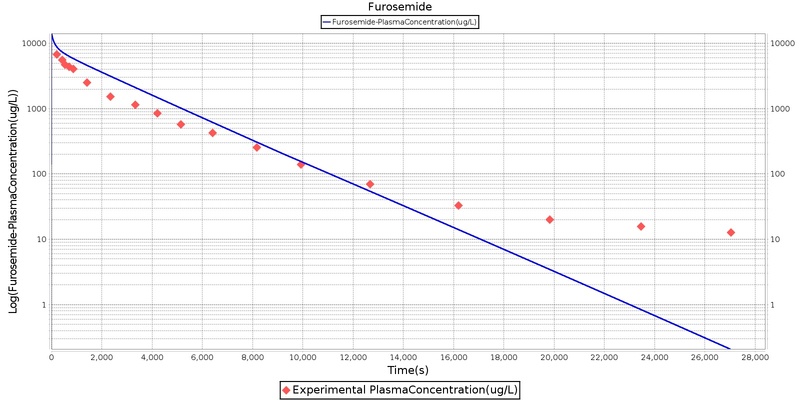 The physical chemical properties of furosemide found in the literature were used to produce a good fit for the plasma concentration. The experimental data was found in . Figure 6. 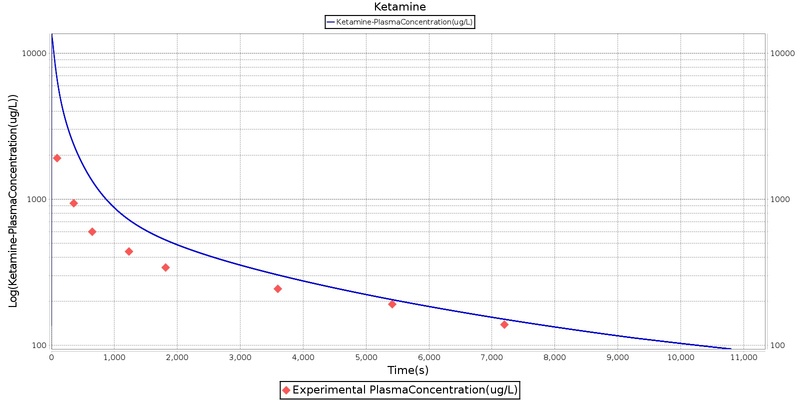 The partition coefficients were calculated from initial physical chemical properties found for Ketamine. However, the fit was unsatisfactory, so the partition coefficients were directly estimated for this drug to produce a good fit with the plasma concentration curve found in . Figure 7. 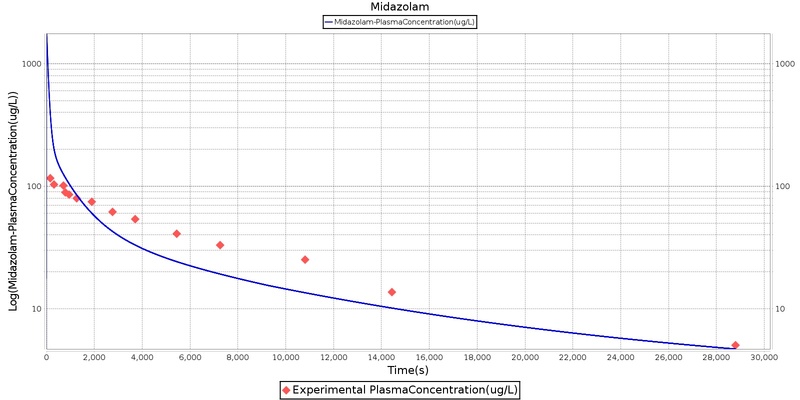 The engine curve for midazolam plasma concentration shows a good overall fit with the experimental data found in . However, the clearance dominant (end) portion of the curve shows that the engine should be clearing more quickly, while midazolam appears to move into the tissues too quickly during the diffusion dominant portion of the curve (beginning). Figure 8. The physical chemical properties of morphine found in the literature were used to produce a good fit for the plasma concentration. The experimental data was found in . Figure 9. 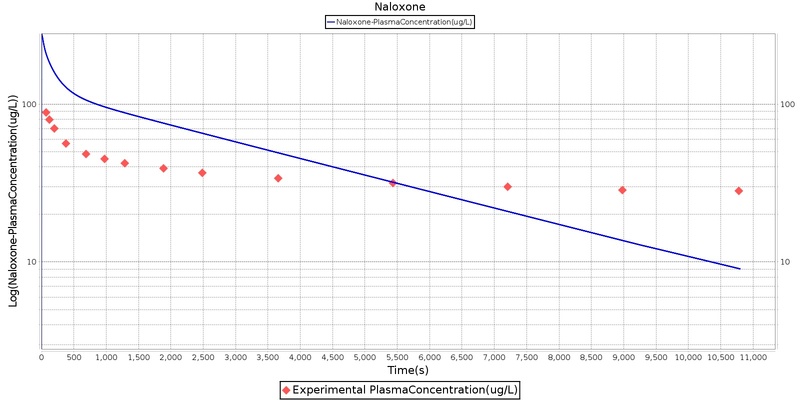 The partition coefficients were calculated from initial physical chemical properties found for Naloxone. However, the fit was unsatisfactory, so the partition coefficients were directly estimated for this drug to produce a good fit with the plasma concentration curve found in . Figure 10. The pralidoxime experimental data found in  was collected after an intramuscular injection. This administration method is available in the engine, so was used to validate the drug. The overall fit between the engine data and the experimental data was good. A slightly higher concentration throughout was evident and may be attributed to the amount of drug that never exits the muscle when this type of injection occurs. In the future, a loss factor could be added to represent this drug amount. Figure 11. 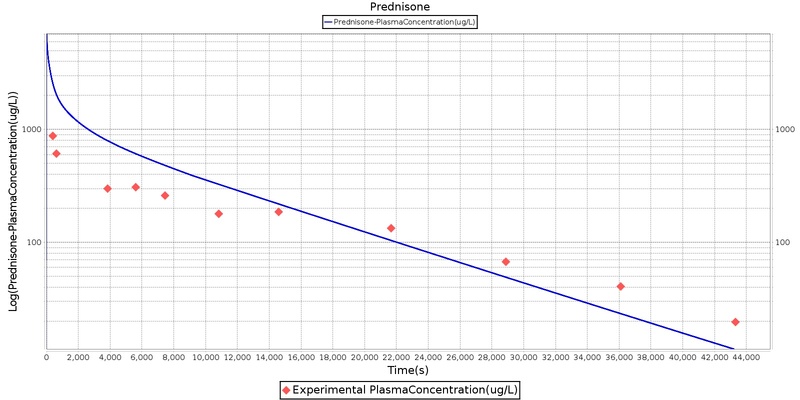 The physical chemical properties of prednisone found in the literature were used to produce a good fit for the plasma concentration. The experimental data was found in . Figure 12. 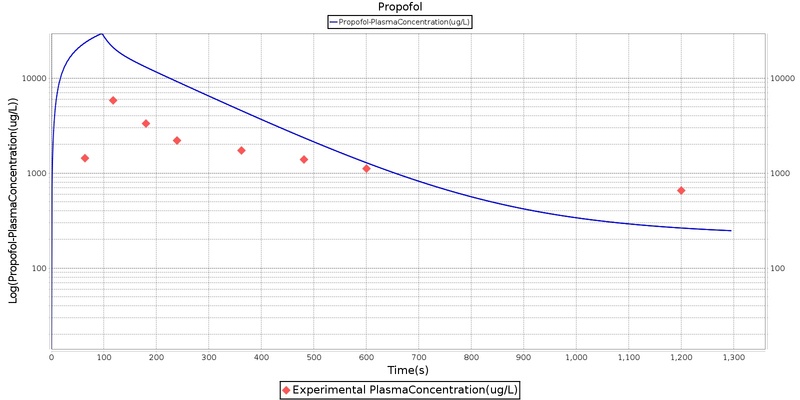 The propofol experimental data was collected during and after an infusion of propofol. The engine is able to support a rate and concentration input for an infusion; therefore, the infusion methodology was used to adminster propofol in the engine. The infusion explains the initial curve evident in the plasma concentration. The initial diffusion dominant portion of the curve shows a reduced diffusion into the tissues compared to the experimental data; however, the clearance dominant portion of the curve shows good agreement with the data found in . Figure 13. 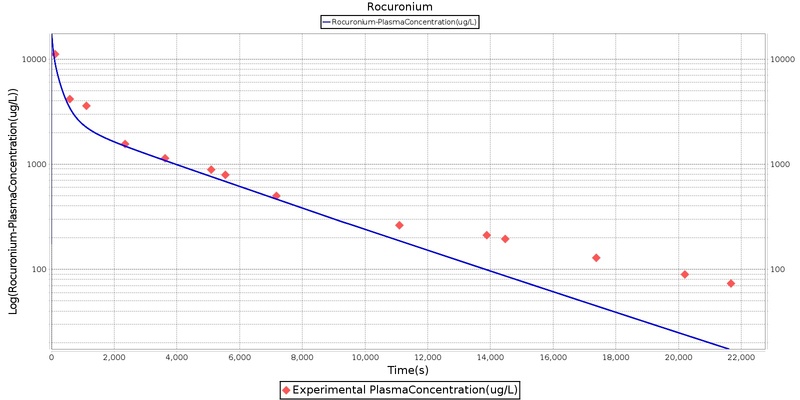 The calculated plasma concentration curve for Rocuronium shows good agreement with the experimental data found in . This is particularly true for the diffusion dominant portion of the curve, while the engine clearance is less than that shown in the experimental data. Figure 14. The succinycholine pharmacokinetics were initially calculated from the values found in literature for the physical chemical properties. However, this were significantly adjusted to attempt to match the calculated plasma concentration to the experimental data found in . The above results show that, in general, the model chosen for the engine produces good agreement between experimental and calculated data. However, it also reveals that for some drugs, this model does not appear to be valid. Future work will investigate the incorporation of vaporized substance methodologies, and additional partition coefficient calculations that may prove more accurate for specific drug types. Further statistical analysis will also be undertaken to assess the model performance rather than solely relying on a qualitative analysis. The pharmacodynamic effects of the drugs were validated by comparing the effects of each drug to a number of clinical parameters. A summary of the drug validation is shown in Table 5. More details on the individual scenario validation can be found in the Drugs Scenario Validation Matrix. Table 5. The engine drug library was validated qualitatively with published values and using subject matter expertise. Green indicates good agreement with validation data, yellow indicates agreement with a general trend with some minor disagreement, and red indicates a disagreement with the validation data. The number indicates the number of output parameters for each category of validation success or failure. Table 6. 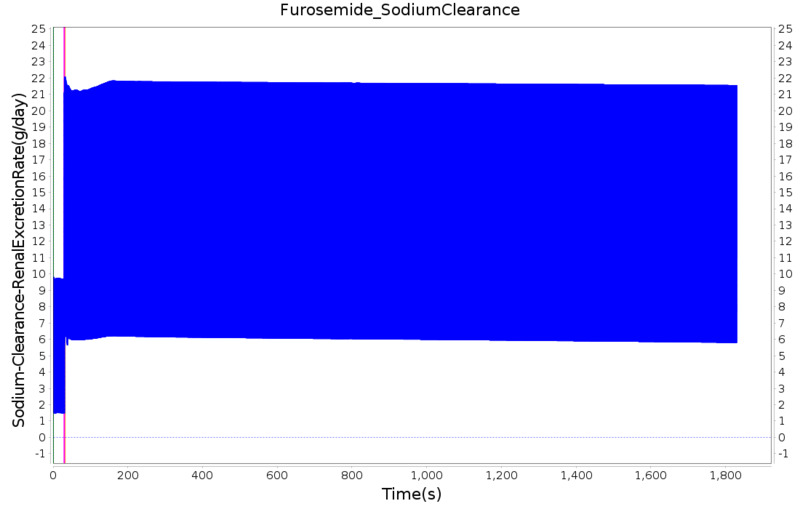 The validation results for liquid-modeled drugs. Administer Midazolam - 5 mg Drug Onset in 1-3 min and lasts 30-60 minutes 30 70 Mild Increase  p200; 5-10% Decrease  Moderate Decrease  p200; 15-25% Decrease  Moderate Decrease  p200; 15-25% Decrease  Moderate Decrease  p200; Marked Decrease To 0  As long as some respiration rate, little change. If RR=0, then begins to drop along O2 curve. Administer Morphine- 42 mg Drug Onset in less than 2 minutes 30 100 Mild Decrease  p200; 5-10% Decrease  Decrease - dose dependant  p200; 5-10% Decrease  Decrease - dose dependant  p200; 5-10% Decrease  Marked Decrease  p200; 15-25% Decrease  As long as some respiration rate, little change. If RR=0, then begins to drop along O2 curve. Table 7. 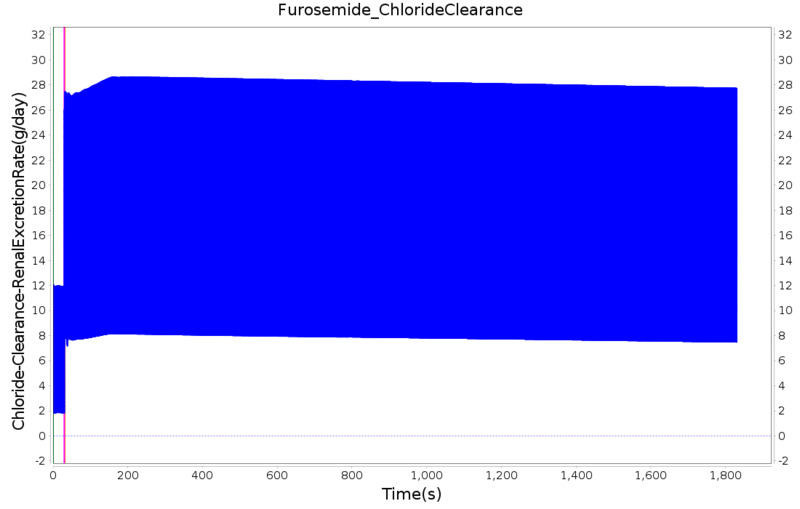 The validation results for gas-modeled drugs. Table 8. 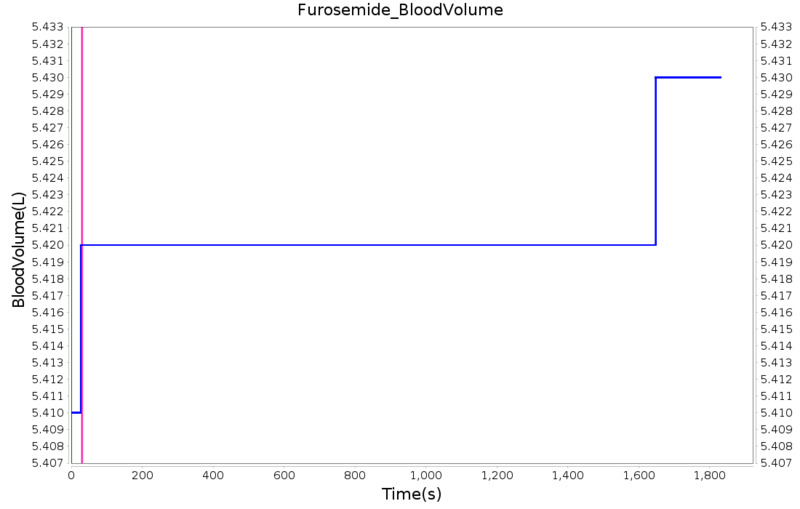 The validation results for furosemide. 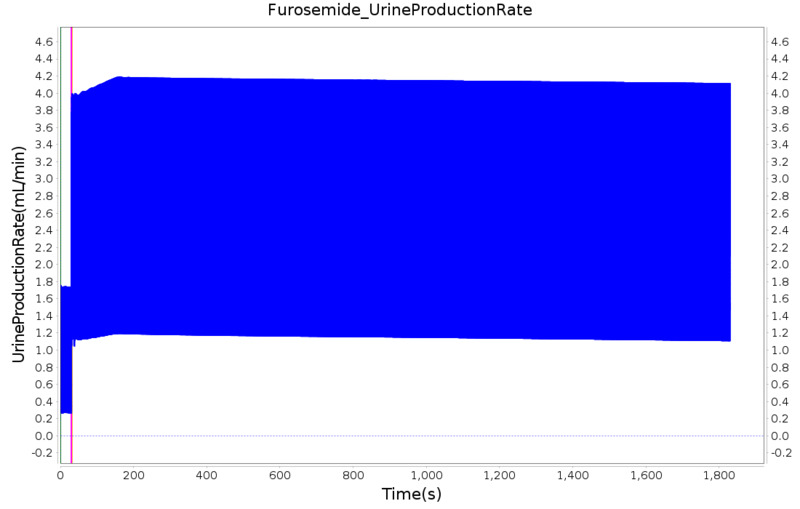 PD effects for the diuretic Furosemide are handled differently than other drugs in the engine. Localized effects are implemented via a tubular permeability modifier. This effectively simulates Furosemide's effect on the tubular luminal Na-K-Cl co-transporter, inhibiting reabsorption of fluid and ions into the vasculature, as shown in figure 15. The permeability modifier is a function of the PK effects of the drug concentration in the blood plasma. These concentrations are then mapped to a Hill-type sigmoid to determine appropriate tubular reabsorption inhibition via reducing the permeability of the tubular lumen, see Renal Methodology. This effectively increases the urine production rate and ion excretion, and reduces the patient's total blood volume. To see the effects of the drug on the cardiovascular system during ventricular systolic dysfunction, see Cardiovascular System. Figure 15. The diuretic furosemide causes an inhibition of reabsorption due to its effect on the tubular lumen co-transporter. Total blood volume decreases as urine production and ion excretion increase. Eventually, as the body clears the drug, urine production and ion excretion both begin to return to normal. In general, the drugs in the data library have strong agreement with both the published data and subject matter expertise. The biggest limitation lies in the transient response to drugs. Currently, the system tolerances provide a response within 30–60 seconds for all drugs, regardless of the physiologic onset time. The drug response also wears off quickly for all drugs. It is difficult to specify the desired pharmacodynamic response without a well thought out set of parameters. These issues will be addressed as part of future work on the engine by validating the pharmacokinetic model and implementing and validating a pharmacodynamic model. These models and the combination of these models represent a positive step forward for drug simulation. The parameters are intuitive and accurate for each drug and additional drugs can be added for an expanded drug library.